Why is design so important for an eCommerce site? Before jumping into picking the best premium Shopify themes lets discuss why your store design matters for better conversions or any conversion. While the simplest answer to this would be – “because you will not get another chance to create a first impression,” it’s not that simple when it comes to designing an online store. An ideal web design for an eCommerce store would be the one that is not only visually appealing, but also providing its customers a good shopping experience, which potentially can lead to better sales. eCommerce store design plays a key role in defining user experience. Brand Awareness – A consistently designed eCommerce store is what attracts customers. Your design is what reflects how your business is, and how serious you are about your products. Bounce Rate – A major reason of a high bounce rate is poor design. A great design is the one that gives the information your customer is looking for. It lets the customers know that they have visited the right place. Website Conversion – A conversion-centric website design will convince your customers to buy. Great designs will help your products sell, because they will take care of all aspects of conversion optimization. Security – A great design comes with greater security. When your customers feel secure to disclose their personal information or credit card details, they will surely come back to you. When we talk about eCommerce store design, this is where the role of the best converting Shopify Themes comes into play. Themes take over an extremely important role in defining your eCommerce site design. 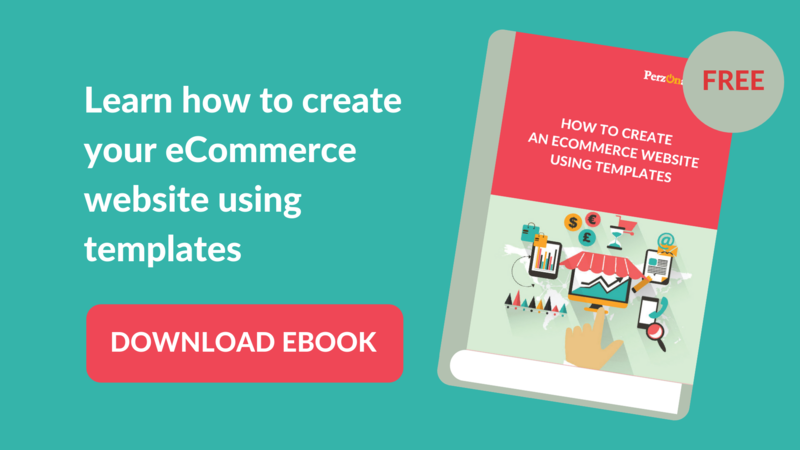 Download your guide and learn how to use themes to create a visually appealing eCommerce website. Shopify is a leading eCommerce website solution and you will find premium Shopify themes, both feature-rich and beautiful. Then whether you are a start-up or a mature business, you will always find a highest converting Shopify Theme that will perfectly fit the bill. In this post, we will talk about the 10 best Premium Shopify eCommerce themes for 2018. But first, you need to know why you should buy Shopify themes over others. The premium Shopify themes are fully customizable, owing to Shopify’s long lasting dedication to providing a fully integrated shopping cart solution. The premium eCommerce themes by Shopify make the website beautiful and functional – showcasing products as desired, accepting online payments and carrying out order tracking, fulfillment etc. Shopify Theme pricing plans are based on a monthly billing system. There are different payment plans to suit an individual’s needs. The themes are SEO friendly and hence, are optimized for conversions. 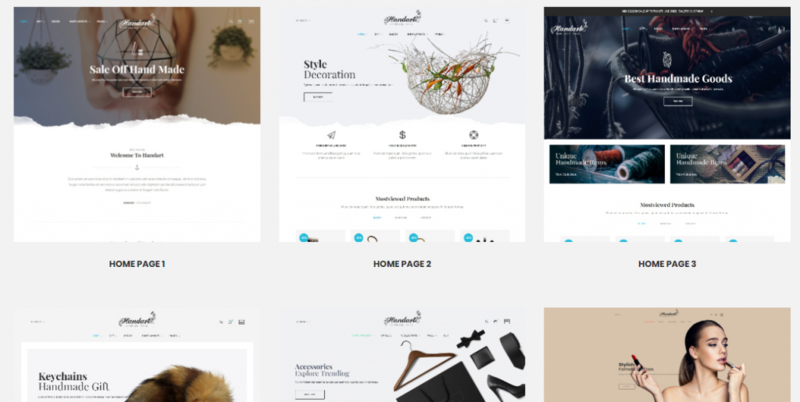 All Shopify premium themes have contemporary, classy and aesthetic look&feel. The themes are cross-browser compatible and responsive. The premium shopify themes are backed up by intelligent coding and a great customer support. Mimosa is built on the responsive Bootstrap framework, comes with 6 attractive homepage and stunning color options. The admin panel is nice – showcasing tab products with product categories, type of products or all products. The theme is customizable thus you can add and/or remove modules per row according to Bootstrap standard without a need for coding. With theme configuration, you can enable CSS customization, rotator image, on/off quickview, catalog mode etc. Ajax Layered Navigation and Category module makes your Category page smooth. Filter is great with prices, manufacturer, color, size etc. The theme layout is neat and minimalist with white background and black text. 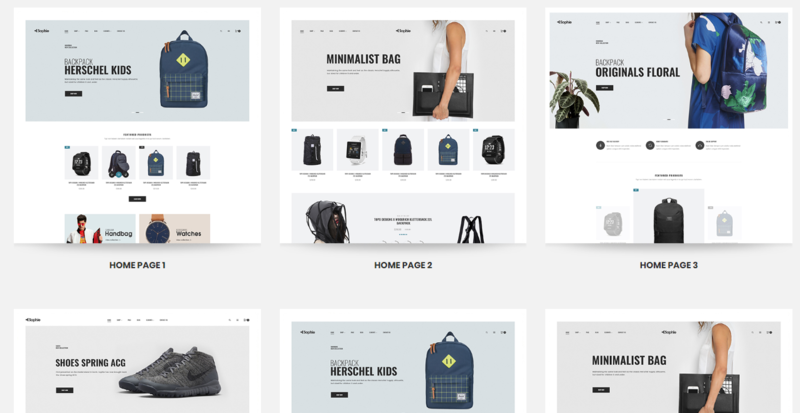 A lot of times you will be tempted to buy free Shopify themes, which I would understand, but this premium Shopify website theme lets you do so much more with your online store that it is worth a try. This premium Shopify theme with high customization has the capability to showcase the content on high resolution Retina screens. Aero is compatible on most browsers across devices – such as desktops, laptops, tablets, and mobile phones. You can also distribute the products easily with OpenCart extensions. There is also the option of blogs and testimonials. The demo data is very practical and informative. Importing this demo data is convenient, too. The homepage is characterized by large banners with stunning imagery of cars, neat headers and footers, sidebar styles and options. Ideal for: Cosmetics, Food, Organic Products, Beauty, Nutritional food and drinks. If you want to sell organic products such as nutritional food & drinks and cosmetics, then Organica is the theme to go to. It is an advanced theme with features which will make it appealing at the first instance. The Daily Deals are made to stand out and attract the attention of the customer and is styled beautifully. Other things such as New and featured, bestsellers and ‘on sale’ products are displayed in Products Slider and Product Tabs Slider module of this premium Shopify template. If you want to sell organic products such as nutritional food & drinks and cosmetics, then Organica is the theme to go to. Tweet This! You have the scope of advertising with Banner Slideshows with big images, effects and useful text. The theme comes with a Blog section and Testimonial. The Product ‘Quick view’ shows information about a product without having to access the product page. Related Products Slider is integrated in to the Product page to optimize your sales. Ideal for: Fashion, Clothing, men store, women store. With a fresh white, black and brown color combination, Domino is a stunning theme to reflect your fashion products. It is fully responsive across any device. Bootstrap 3 and css3 technology enables easy customization, and an Ajax Layered Navigation and Ajax Toolbar in category page make customers look for and purchase products faster. The space between modules and static blocks makes for an eye-catching view for customers. The blog is easily customizable with posts in admin. You can advertise your products and your store along with promotions through featured posts. This is one of the best converting Shopify themes you will find for your online store. 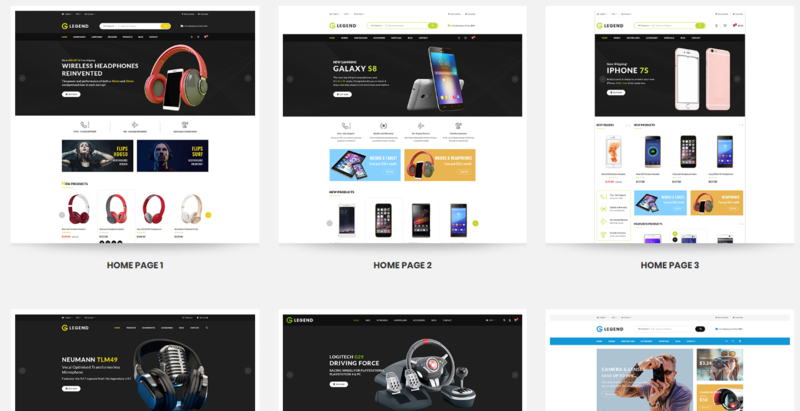 Responsive and retina ready, the Legend Digital premium Shopify Theme is a touch-friendly template that is bound to give your electronics eCommerce store incredible success. It has features like Menu, Cart, currency, sign-in options and language showcased as dropdowns to make sure nothing will divert customers’ attention from the main content. It has the ability to integrate YouTube/Vimeo/mp4 formats of content to the slideshow. The product carousel is designed to bring in more conversions and you can customize top menu from the framework settings in the admin panel of the Mega Menu settings. The theme is SEO friendly and supports more than 600 Google fonts. With powerful features such as Mega menus, revolution sliders, unlimited colour options and easily customizable headers and footers, this theme is best for a single product showcase or multiple products of the same range. The revolution slider allows you to build slideshows for any page with ease. You can also add multiple columns to your drop-down menu with the Mega Menu. The theme is coded for a fast and future ready site with built-in SEO capabilities. When you buy premium Shopify themes like Quark, you wouldn’t have to worry about user experience. Everything starting from headers, menu and extensions is fully customizable in this premium fashion Shopify theme that you definitely need to consider in 2018. The slide is smooth with transitions of text and images. The Most Viewed Products Slider with ‘load more’ functionality shows the ‘most viewed’ products. ‘Daily deals’ module includes a timer and a description of special products. ‘New/Sale’ labels are nice and they highlight in the new and special products. Static blocks come with elegant images and a useful text. The nice font brings a fresh feel to this theme. The modules are easily customizable in the Admin panel. The theme is SEO friendly and optimized to increase sales. HandArt is a fully customizable, responsive premium website theme for artisans and ideal for eCommerce stores dealing in handicraft items. The theme comes with CMS blocks and banners, making it easier to visualize your content and even insert ads on your page. Translation of the title of modules is easy in admin panel. If you plan on having a large collection of products, the Megamenu helps in organization. The Custom Slider homepage blends beautifully with the other extensions, and the full-screen photo homepage is the highlight of the theme. 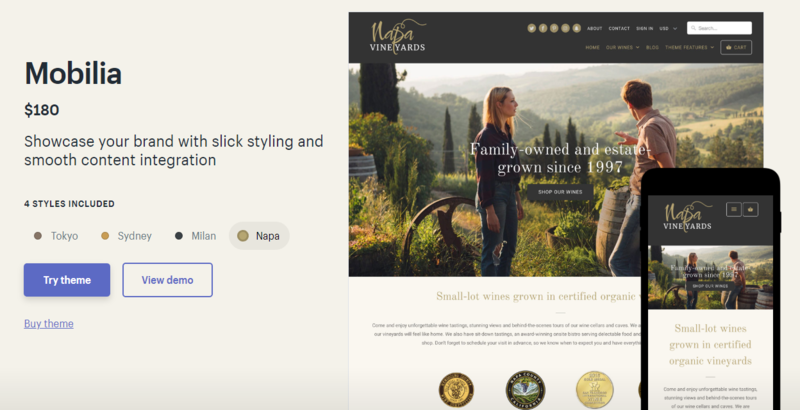 One of the premium eCommerce themes designed and supported by Out of the Sandbox, Mobilia comes with four different styles – namely, Tokyo, Sydney, Milan and Napa. You have the option of featuring a full-width video on the homepage, which gives you a great opportunity to welcome your new visitors. You can set up the rest of the homepage to display your best products, your story, and other important items your customers might be interested in. Once a visitor clicks through a category page, they can scroll through the different products that are available under that category. The ‘quick shop’ button enables your customers to get an instant preview of an item and find out more, without having to leave the current page. Some other useful features include social media integration with an Instagram feed widget, Disqus powered blog comments and a customizable sidebar. 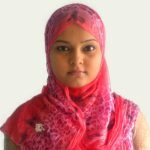 Primarily configured as a fashion and clothing online shop, Banita has a library of different headers and footers, widgets etc. to choose from. You can easily drag and drop your choice of elements in a desired position and start building your own custom store. The banner generator tool is another feature which helps you set up your store in your own way. This theme allows you to run your Shopify website in catalog mode if you are not quite ready to launch the store yet. This popular premium Shopify themes allows you to disable the cart and login functionality, while still giving your visitors the ability to browse your inventory. With Instagram and YouTube integrations you can use social media to promote your store seamlessly. Minimalist design. Responsive. $45 Future Updates included. Aero Easy to use. Products can be distributed easily with OpenCart extensions. Customizable Quick 6 months support from the author Eye-catching design. Shiny with large slide shows as banner. Responsive. $56 Future Updates included. Organica Enhanced theme customizations with sections. Customizable product grids Easy 6 months support from the author Green is the primary color with white background and black text. Multi-layout with mega menu. Responsive $56 Future Updates included. Domino Customizable, Makes customers buy products faster, provides an eye-catching view. Easy 6 months support from the author Amazing combination of colour, texture and arrangement. Clean and modern. Responsive $56 Future Updates included. Legend lot of advanced and useful features. Cart, menu, currency, language, and sign-in options are presented as dropdowns. Easy 6 months support from the author Product carousel promises more conversions. Grid layout, elegant image slider, rotator images etc. Responsive, touch-friendly and Retina Ready. $56 Future Updates included. Quark SEO compatible. Essential features like translation-readiness, easily adjustable headers and footers. Easy 6 months support from the author Modern & Responsive. Comes with Unlimited colour options, Revolution sliders, Mega Menus, $56 Future Updates included. Sophie Easily customizable. Customizable mega menus, Blogs included. Easy 6 months support from the author Flexible design, Static blocks with elegant images and useful text, nice font. Responsive. Footer is neat. Dropdown cart layered navigation. $45 Future Updates included. HandArt Custom Slider homepage combines wonderfully with the other extensions, easy customizations available. Customizable mega menus. Easy 6 months support from the author Responsive and retina-ready, drag and drop page builder for creating content pages. More than 4 homepage layouts. $39 Future Updates included. Banita library of different headers, footers, and widgets, customizable, banner generator tool. Customizable. Easy 6 months support from the author It enables you to run your Shopify store in catalogue mode. Responsive. Absolute theme control, interactive sliders, versatile design. $59 Future Updates included. Not all of the most popular Shopify themes are created equal. When you set out to buy premium Shopify themes and compare the best premium Shopify themes, remember to align it to your product and your brand. Look closely at the features like responsiveness, navigation, SEO capability etc., before making a choice. 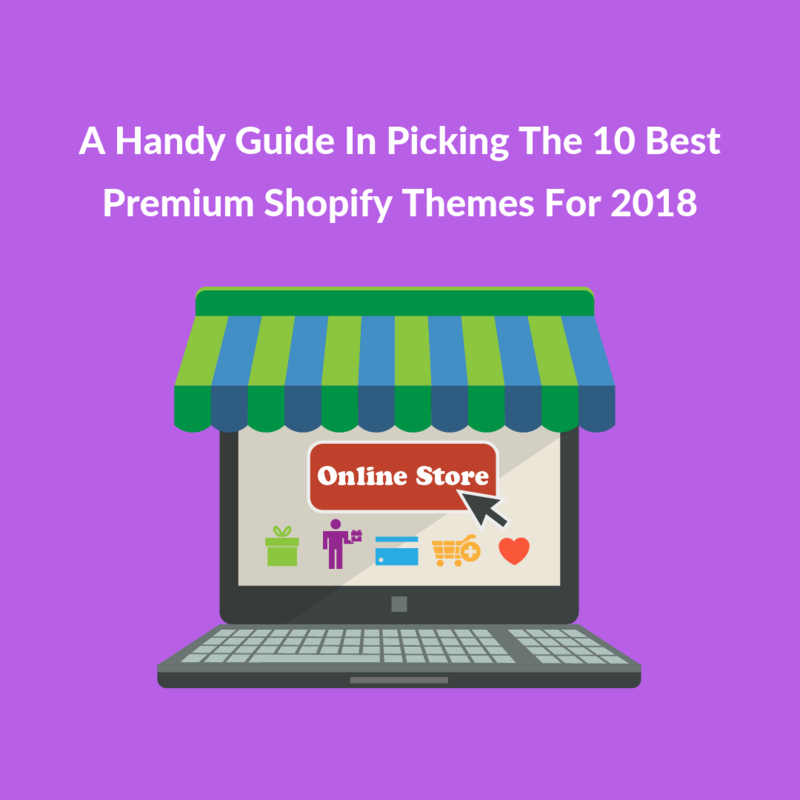 I am sure this handy guide will surely provide you with a huge jump start in picking one of the Premium Shopify themes in 2018. Be sure to checkout my other articles on Premium Shopify themes for SEO and Dropshipping.